Rich in history and know-how, Cartier's luxurious creations are inspired by the same boldness and refinement that have always been characteristic of the French house, since its foundation in 1847 by Louis-Francois Cartier in Paris. From the conception of Must and Santos in 1981, every Cartier perfume has always offered a beautiful and unique scent. After the blossoming lily featured in the Eau de Parfum, Mathilde Laurent, Cartier in-house perfumer, created a new expression of Baiser Volé: The Eau de Toilette, a rising lily, a youthful floral. Founded in 1847 by Louis-François Cartier, the Cartier brand is the essence of luxury. In catering to the finest clientele and using the finest materials, they have steadfastly retained a preeminent role as a purveyor of absolute splendour. When you think opulence, you think Cartier. When Louis-François's grandsons Louis, Pierre and Jacques inherited the company, they saw the potential of a worldwide brand. Under their control, Cartier styled kings and queens from all over the world, designed the first mass-produced practical wrist watch, and opened flagship stores in the biggest cities in the world. Today, Cartier remains just as prestigious. Alongside its watches and magnificent pieces of jewellery, Cartier is also a master at creating unforgettable fragrances. Its perfumers select the most precious essences to form subtle harmonies. 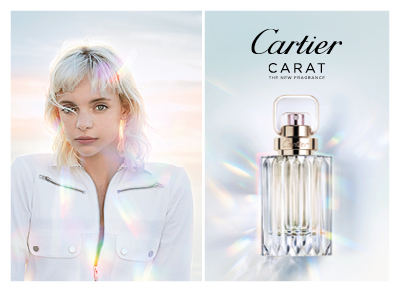 Each fragrance captures that distinctive Cartier aura. The fragrance collection is characterised by its air of sumptuousness. From quality ingredients to meticulously designed flacons, each Cartier scent presents an entire experience. The range spans fruity harmonies to flora, woods to freshness. Try Delices de Cartier for a lighthearted and luscious women's fragrance, or Cartier Roadster for a wonderfully orchestrated men's scent.